Crashing, smashing and destroying your hearing in your local multiplex at a rate of knots is Rampage the latest in Hollywood’s undeterred attempts to fashion something worthwhile out of gaming nostalgia and culture. The ever likeable, charismatic and cut out and keep template for action heroes Dwayne Johnson is Davis Okoye a primatology expert and ex-military task force operative (what are the chances eh?) who befriended and adopted George, an albino gorilla. The two have a strong bond and understanding that often leads to sign language gags and CGI gorilla chuckles. Unbeknownst to the pair high above them in space (why not) a multi-million-dollar corporation is conducting experiments on animals using a mysterious pathogen that increases a subjects’ growth and aggression exponentially. When the inevitable destructive incident incident occurs, canisters of the pathogen fall to earth and George becomes infected but would you it believe he’s not the only animal to be affected. Rampage is based on the arcade game in which giant animals are charged with destroying buildings and wrecking cities. That is pretty much the entire purpose of the game, bash the buttons and destruction will occur, so to stretch this premise into a fully-fledged film may seem unnecessary and if you were cynical a cash grab. To be honest that wouldn’t be an unfair assessment! Before heading into Rampage I wanted to have fun, I wanted big spectacle and I wanted dumb action. It was certainly big and bombastic, there was fun to be had in places but ultimately it is one of the dumbest films I have watched in recent times. All logic and reason has been thrown out the window, the script is clichéd, predictable and at times just terrible. Dwayne Johnson does his best to steady the ship, he is likeable, very watchable and has a charm that seeps out of the screen but this is simply not enough to balance out the nonsense that the film contains. The sinister corporation heads are no more than pantomime villains doing inexplicable things for inexplicable reasons like calling three enraged beasts into a huge city via a recently installed transmitter (how lucky is that) in order to have them destroyed and get some of their DNA for future experimentation. These suits are prepared to risk the destruction of an entire city and countless loss of life to further their cause and risk the destruction of their own building in the process. It really is that daft of an idea. Complete madness and the hope that no audience member notices seems to have been the Rampage mantra and it would be a lie if I didn’t declare that there were points I found myself swept away in the chaos at times. However, the CGI is poor in important moments with a constant flux in the size and scale of our destructive beasties, the destruction immeasurable and none of the watching military forces seem aware that bullets will not get the job done no matter how big the gun! These things matter as daft as that may sound but with greater care given to these problems a better film could have been made. I fully appreciate that some films are just meant to be fun, an opportunity to switch off from the stresses of life and lose yourself in a world of big, dumb nonsense and popcorn. As a fan of the Fast and the Furious franchise I know this to be true, but even those pieces of bombastic cinema nonsense make sense (most of the time). Rampage is a film based on a game that requires the player to wreck and ruin without care or afterthought. The film does not care or give afterthought to the mayhem it creates, so perhaps it could be argued then that they’ve remained truer to the test than I’ve given them credit for after all! Buy a bucket of popcorn and your bodyweight in fizzy drinks, leave your brain at the door and embrace the chaos you may have a decent time, sadly I just couldn’t play along. Set years after events of 2014s Dawn of the Planet of the Apes, Caesar (Andy Serkis) and his band of apes find themselves hunted and forced into a deadly conflict with an army of humans led by a ruthless Colonel (Woody Harrelson). After the apes suffer severe losses, Caesar wrestles with his darker instincts and begins his own journey for vengeance. As the quest finally brings them face to face, Caesar and the Colonel are pitted against each other in an epic battle to determine the fate of both their species and the future of the planet. I've always loved the Planet of the Apes movies. Even in their earliest rubber faced forms they've always intrigued me and grabbed my interest. Societal structures, uses of religion and politics have always been at the core of their story. 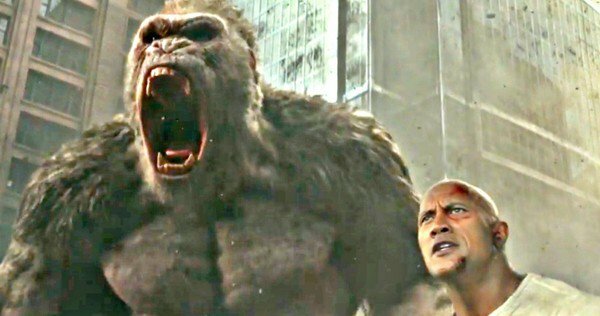 These 'new' apes movies have been no different and Matt Reeves has, with this latest instalment, rounded out what must surely be considered part of the 'great trilogy' conversations many cine lovers enter into and wrestle over. Picking up some of the threads from Dawn of the Planet of the Apes, Caesar still wrestles with his guilt over the demise his compatriot Koba and struggles to maintain the moral high ground when pushed to the limit by Woody Harrelson's maniacal Colonel. Harrelson's portrayal will draw many to comparisons with crazy authority figures of war films past and indeed the movie itself at one juncture nods to this. While this is a war movie in part the film's true heart lies within the Western genre. Caesar as the lone gunman, powered by revenge to see justice done is only missing a stetson in order to make the comparisons complete. Striding across plains and vistas on horseback with a stirring score, you could easily close your eyes and be transported to that golden age of cinema with gunshots and ricochets provided by a gunslinging John Wayne. The CGI throughout the film is breathtakingly realistic with special mention given to Caesar's moral conscience, Orang-Utan Maurice being wonderfully rendered, even down to small hair inflections on his joules. I was convinced that at times he was indeed real so tender and endearing was the performance from mo-cap artist Karin Konoval. Andy Serkis will always garner plaudits and interview time for his front and centre performance but all involved deserve huge credit. This realism is particularly important as this film is only to be released (initially) in 3D. Often I'm unimpressed with 3D films but so engrossed was I with the story in front of me I forgot about the glasses layered over the top of my own spectacles. While I consider the 3D unnecessary it is not so distractingly bad that it hinders the film in anyway. In fact the opening scene with soldiers creeping towards an ape base was impressive viewing. This western piece also leans towards the biblical at times with parallels between Caesar's trajectory and that of Moses being most apparent as the film proceeds. Caesar has already broken one of the apes commandments in the previous film and as with Moses this has repercussions that he could not have predicted. Finding his people enslaved by Harrelson's Colonel it would not be unthinkable for Caesar to cry 'let my people go' with Heston like fervour. Nods and winks to the classic apes movies will also raise a smile for those fans of the original films and in many ways these potentially allow this film to be the climax of this prequel saga. This set of apes movies has provided the antidote for my blockbuster cynicism following each release and if this to be the end I am more than content. Should a further tale be found within these simian screen sensations however, I will have no complaints. War for the Planet of the Apes is released on 11th July in 3D.